Welcome to the 53rd Chuckanut Foot Race! Presented by Fairhaven Runners & Walkers. When: Saturday, July 6, 2019 at 9:00am. 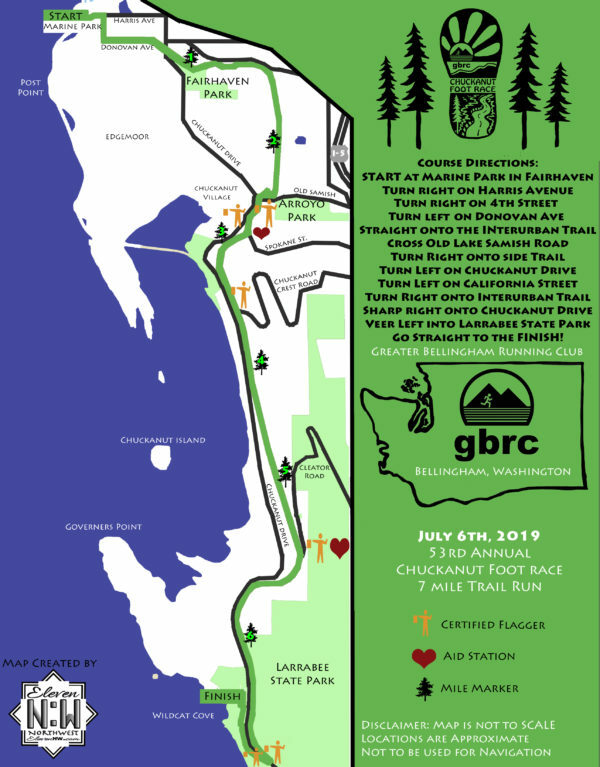 This point-to-point, seven-mile trail race starts at Marine Park in Fairhaven and finishes at Larrabee State Park, the oldest state park in Washington. After about 1/2 Mile on paved streets the course follows the legendary Interurban Trail, which threads through the Chuckanut Mountains and features gorgeous views of Chuckanut Bay and the San Juan Islands. Online Registration is now open and remains open until July 3rd. 11:59 pm. Race Day Registration will be open from 7:45am–8:45am at Marine Park Fairhaven. Pre-Registered Runners can pick up their Bibs starting at 7:45am. up until the start of the Race. There will be plenty of post run hospitality at the Finish. Awards will be given to the top 3 finishers Male/Female. Placement Ribbons will be given three deep in 5 year increments in each category starting with age group 11-15 through age group 90-95. Awards can be pick up at the Awards Table following your Race. Baker Bus will be shuttling runners from the Finish In Larrabee State Park back to the start at Marine Park. Shuttle service will begin once we have a full bus and will continue until all runners are transported back to the start. Drop bags will be collected at the start and transported to the finish. We ask that you bring your own bag for your belongings. Aid Stations will be located at Spokane St. and Cleator Rd. on the Interurban Trail. Cups will be provided but we encourage all runners to bring their own water bottles to cut down on waste. Aid Stations will begin shutting down at 10:30 am. And the finish line will close at 11:30 am. 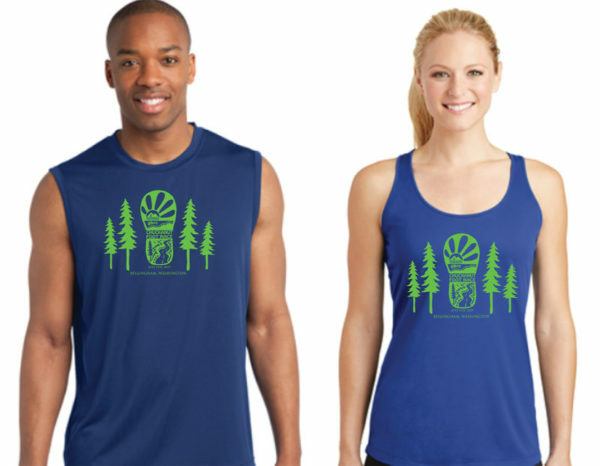 Sport-Tek Sleeveless Tee’s are available for Men and Racerback Tanks are available for women for $20.00. Shirts are pre order only. There will be no shirts available Race Day. Deadline to order shirts is June 25th. 11:59pm. BBay Running and GBRC have joined together to start a program for runners to recycle their old running shoes. 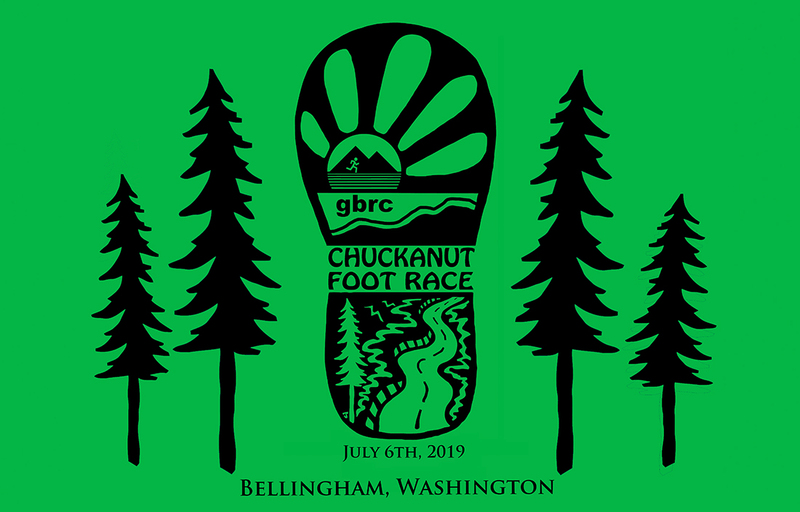 So bring all your old running shoes with you to the Chucknut Foot Race and we will take them off your hands and keep them out of our landfills. For more info on this program go to shoe recycling & reuse at bbayrunning.com. 15% Discount Rate at Oxford Suites Bellingham for GBRC Members, Participants & Attendees of the Chuckanut Foot Race. 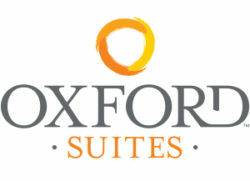 To access the discount through the Oxford Suites Bellingham website, just type “GBRC” in the Promo Code box.